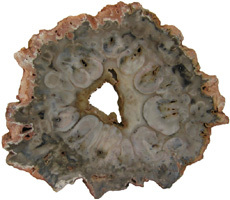 Collectors of petrified wood focus on permineralized plant material related to arborescent (tree-like) plant life. 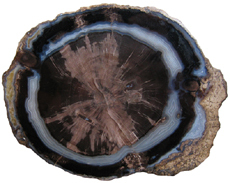 Fascination with fossil wood may be related to human reverence for living trees. Trees provide humans and other organisms with shelter and food. We plant trees near our homes and in our communities to enrich the environment. Trees define many biomes. Trees help moderate Earth’s atmosphere, sequestering carbon and releasing oxygen. Trees are one of the first plant categories a child learns. Asking a person to identify a plant as a tree may seem like “child’s play”; however, defining a tree can be difficult. The United States Forest Service defines a tree as a woody plant at least 13 feet (4 m) tall with a single trunk at least 3 inches (7.62 cm) in diameter at breast height (4.5 ft; 150 cm) (Petrides, 1993, p. 4). This definition fits well with many people’s concept of a tree being a large, columnar, woody, long-lived organism. However, many trees are not constructed from secondary growth (wood), such as palms and tree ferns. Some species, such as black willow, are multi-trunked. Size can also be problematic as an Engelmann spruce growing at tree line may be small compared to one growing at a lower elevation. Some species, such as the juniper, can grow as shrubs or trees. The Japanese art of bonsai demonstrates how environment can effect tree growth to extremes. We will adopt a more encompassing definition of the tree form. A tree is a perennial plant often having a single trunk supporting secondary branches with leaves or a crown of leaves. 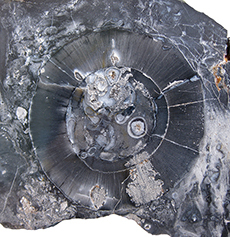 Evidence for the first fossil trees and forests occur in the Devonian. The oldest arborescent plant, Eospermatopteris, is related to ferns (Taylor, Taylor, and Krings, 2009, p. 479). Fossil forest composition changes through geologic time, reflecting variety in evolutionary strategies for constructing a tree form. It is helpful and informative to study the anatomy of various trunk designs. Evolutionary adaptations for trunk structure can be recognized by the arrangement of tissues and organs. A quick survey of plant organs and tissues will enhance our discussion of the various evolutionary strategies for constructing a tree form. Plants are made of four types of organs: roots, stems, leaves, and reproductive structures. In turn, these organs are composed of three basic tissue systems: the ground tissue system, the vascular tissue system, and the dermal tissue system. Ground tissues including parenchyma, collenchyma and sclerenchyma are involved in photosynthesis, storage, secretion, transport, and structure. Parenchyma tissue generates all other tissues. Living parenchyma cells are involved in photosynthesis, storage, secretion, regeneration and in the movement of water and food. Parenchyma cells are typically spherical to cube shaped. Collenchyma tissue provides structural support for young growing organs. Living collenchyma cells are elongated cylinders and help to make up the familiar string-like material in celery stalks and leaf petioles. Sclerenchyma tissue provides support for primary and secondary plant bodies. Sclerenchyma cells often have lignified secondary walls and lack protoplasm at maturity. Elongated slender sclerenchyma cells known as fibers make up well known fiberous material such as hemp, jute, and flax. Shorter sclerenchyma cells known as sclereids make up seed coats, the shells of nuts, and account for the gritty texture of pears. The vascular tissue system is represented by the water conducting tissue xylem and the food conducting tissue phloem. Xylem tissue is made primarily of parenchyma cells, fibers, and tracheary elements. Tracheary elements are represented by tracheids and vessel elements. Tracheids and vessel elements are enlongated cells that lack protoplasm at maturity and have secondary walls strengthened with lignin. Vessel elements are lager in diameter than tracheids and are an adaptation of flowering plants. Tracheary elements form an interconnected system of overlapping, leaky tubes that conduct water and minerals from the roots to the rest of the plant. Transpiration of water from leaves pulls columns of water enclosed within these stacked, tube-like cells up the plant. Phloem tissue is made primarily of sieve elements, parenchyma cells and fibers. Sieve elements are represented by sieve cells and sieve-tube members. Sieve cells and sieve-tube members are elongated cells that are living at maturity. Both cell types are closely associated with parenchyma cells. Sieve-tube members possess larger pores and are an adaptation of flowering plants. Sieve elements form an interconnected system of tubes that transport the food products of photosynthesis made within leaves throughout the plant. The dermal tissue system forms a protective outer covering including the epidermis and periderm. The epidermis forms the outer most layer of the primary plant body. During secondary growth the periderm replaces the epidermis. The periderm consists of protective dead cork tissue, the cork cambium, and phelloderm, a living parenchyma tissue. Tissues that make up plant organs are produced from clusters of actively dividing parenchyma cells called meristems. Cells produced from meristems differentiate into the specialized cells making up tissues. Apical meristems occur at the tips of roots and shoots. Apical meristems are responsible for primary growth or increase in length. Lateral meristems such as the vascular cambium and cork cambium (phellogen) produce secondary growth, increasing the girth of stems. Typically, the vascular cambium is bifacial, producing secondary xylem to the inside and secondary phloem to the outside. Secondary xylem makes up the wood of a stem, which will be explored in more detail when looking at modern conifers and angiosperms. The cork cambium produces phelloderm to the inside and phellem (cork) to the outside. Together, the phelloderm, cork cambium, and cork make up the periderm, a protective layer made by secondary growth (Raven, Evert, & Curtis, 1981, pp 417-429). The term bark refers to all tissues outside the vascular cambium. Knowledge of how primary vascular tissues are organized within the central cylinder of stems and roots can aid in identification. The central cylinder of a sprout axis, which includes vascular tissue and associated ground tissue, is called a stele. Structurally, one can think of three basic ways in which the stele of stems and roots are organized based upon tissue found in the center of the axis. The center of a stele can be made of solid xylem, pith or vascular tissue embedded in ground tissue. A protostele has no pith; instead the center is a solid core of xylem. Most primitive plants and roots are protostelic. Three types of protostele are recognized by the shape of the xylem core in cross-section. In a haplostele, cylinder-shaped xylem is surrounded by a ring of phloem. Actinosteles have xylem with arm-like projections surrounded externally by phloem. 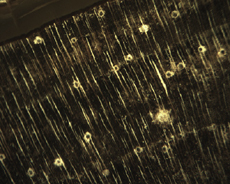 Plectosteles possess plate-like regions of xylem surrounded by phloem. The plates look like they are separate but in fact are connected longitudinally. 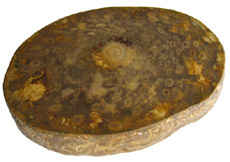 Siphonosteles have a pith surrounded by vascular tissue. 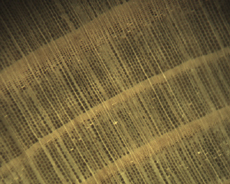 Siphonosteles can have phloem on both sides of the xylem (amphiphloic) or only external to the xylem (ectophloic). Two variations of this structure can be recognized based upon how many interruptions in the vascular ring occur in any one cross-section due to the formation of leaf traces. These interruptions or breaks in the vascular ring are called leaf gaps. Solenosteles exhibit no more than one leaf gap in a cross-section. Dictyosteles exhibit multiple leaf gaps in cross-section. Solenosteles and dictyosteles are found in ferns. All seed plants have primary vascular tissue organized into bundles either surrouding a pith or scattered within ground tissue. Gymnosperms and dicotyledonous angiosperms have vascular strands arranged in a ring around the pith, called a eustele. A variation of the eustele, called the atactostele is found in angiosperm monocots in which the vascular bundles are scattered throughout the ground tissue. The roots of monocots are arranged as a eustele, while in gymnosperms and dicots, roots are protosteles. The eustele was once thought to be derived from the siphonostele, but multiple lines of evidence indicate it is derived from the protostele (Taylor, Taylor & Krings, 2009, p. 220). All arborescent vegetation represent vascular plants with true roots, stems, and leaves. As we explore the anatomy of arborescent plant life we will discover that a variety of tissues and organs have been co-opted as strengthening elements. Several basic trunk structures can be recognized by the arrangement of strengthening elements: solid woody cylinders, fibrous cylinders composed of isolated, intertwined elements and reinforced tube-like cylinders with hollow or soft centers. Permineralized plant material is often cut and polished in the cross-sectional or transverse plane to reveal the anatomy perpendicular to a trunk, stem, or root axis. Familiarity with the anatomy may even allow one to identify the taxon to which a specimen belongs; however, for many specimens radial and tangential sections of the stem must also be studied. In this article, we will focus only on stems in cross-section. You can obtain some general information about major plant groups by visiting the Science Olympiad section of our website. The lycopods or clubmosses (phylum Lycopodiophyta) range from the Silurian to recent times. Lycopods are not mosses. Clubmosses are in fact more closely related to ferns and conifers (Kenrick & Davis, 2004, p. 32). Today 1,500 species of small herbaceous clubmosses represent a small fraction of modern flora. However, clubmosses have a rich evolutionary history extending back 420 million years, which includes tree-like forms. The extinct clubmoss trees or arborescent lycopods dominated the canopy of Carboniferous forests and went extinct during the Permian. Paleozoic tree clubmosses could reach heights of 40 m and attain diameters of 2 m. The best cross-sections of lycopsid stems and trunks come from coal ball cellulose acetate peels. 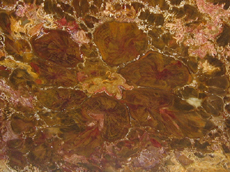 Evidence from coal ball fossils has allowed paleobotanists to reconstruct the growth and structure of these unusual trees. Lycopsid tree stems start out as protosteles with solid xylem cylinders. As the tree grew a pith developed making the upper trunk a siphonostele (click on picture to the left). 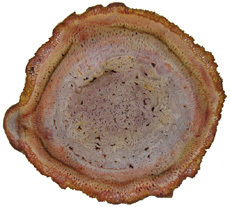 In cross-section the upper lycopod trunk anatomy consists of a small central pith surrounded by a xylem ring with medullary rays. 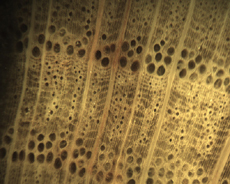 The vascular cambium produced secondary xylem to the inside but, unlike modern trees did not produce secondary phloem to the outside. Although primary phloem is found outside the secondary xylem lycopsid trees apparently did not produce secondary phloem (Taylor, Taylor, and Krings, 2009, pp. 286-287). The core of water conducting woody tissue (xylem ring) was only centimeters in diameter. 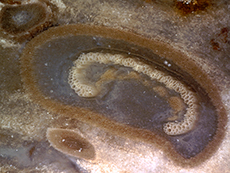 This relatively small xylem ring was encased in a wide area of living parenchyma cells (phelloderm tissue). The cork cambium produced less phellem (cork tissue) to the outside than modern trees. However, the bark had a hard, lignified outer layer. This non-water conducting outer layer provided the structural support for the tree (Kenrick & Davis, 2004, p. 70). Although not hollow, the lycopsid trunk acted as a tube-like structure. In cross-section, 98% of the massive lycopsid trunk was periderm, making the term "bark stem" appropriate for these trees (Selmeier, 1996, p. 139). Not only was the structure of these trees very different from modern trees their growth was as well. As branches grew at the top of the tree they once again became protosteles with very small primary vascular cylinders. Thus, without secondary tissues these branches lost their ability to grow larger. The tree literally grew itself out (Taylor, Taylor, & Krings, 2009, pp. 288 & 289). This determinate growth contrasts with most woody plants, which have indeterminate growth. The horsetails (phylum Sphenophyta or Equisetophyta) range from the Devonian to recent times. Equisetum is the only extant (living) genus (Willis & McElvain, 2002, p. 104). Extant species representing this genus are all small herbaceous plants. Horsetails have jointed stems with vertical ribbing. All the branches, leaves and cones are borne on whorls (Kenrick & Davis, 2004, p. 89). Horsetails (sphenopsids) are closely related to ferns. Some taxonomists place the sphenopsids in the fern division Pteridophyta. Like the lycopsids, sphenopsids also have a rich evolutionary history that includes tree forms. Arboreal horsetails contributed to the canopy of Paleozoic forests. Calamites is the most well known arboreal horsetail. 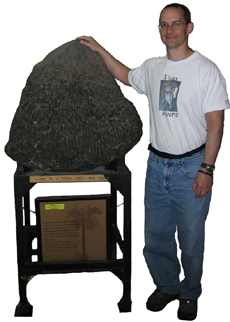 The trunk of Calamites grew in a telescoping fashion from one node to another (Selmeier, 1996, p. 139). Like the lycopsids arboreal horsetails exhibited determinate growth. The stems and roots of horsetail trees are siphonostelic. In cross-section the calamitean stem consists of pith and or a medullary cavity surrounded by primary and secondary xylem (click on picture to the right). The vascular cambium produced secondary xylem toward the inside and most likely secondary phloem to the outside as inferred by preserved root structures (Taylor, Taylor & Krings, 2009, p. 354). The cork cambium produced small amounts of periderm on the exterior. As the tree grew, secondary xylem added to the girth of the trunk, while the central pith area formed hollow interior chambers. The trunk was mostly a cylinder of secondary xylem. The hollow trunk forms a kind of reinforced tube. These trees were fast growing, but sensitive to local buckling (Kenrick & Davis, 2004, p. 70). The xylem or wood of these trees was made primarily of tracheid cells that are very similar to modern gymnosperms (click on picture to the left). Paleozoic horsetail trees reached heights of 30 m, attained diameters of 1 m, and were anchored to the ground with prostrate rhizomes. The tube-like trunk of the lycopsid and horsetail tree supported small, sparsely branched crowns. Ferns (division Pteridophyta or Filicophyta) range from the Devonian to recent times. Extant ferns are represented by over 12,000 species. While many ferns are smaller herbaceous plants, larger tree-like ferns still exist. A type of tree related to ferns was present in the oldest known forest. Middle Devonian fossil trunks from Gilboa, New York provide a window into the earliest forests (click on picture to the right). Stumps with roots stretching out into a paleosol (fossil soil) have been preserved as casts at a site known as Riverside Quarry. 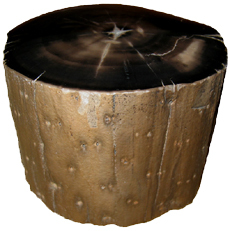 The casts reveal only the outer structure of these tree stumps. From the 1870's and until recently the stumps have been assigned to various plant groups including Psaronius (the tree fern), Eospermatopteris (the accepted name) and a progymnosperm (Nudds & Selden, 2008, pp. 98 & 99). The mystery of Eospermatopteris identity was not solved until recently. In 2007 Stein et al. described the discovery of fossil trees from Shoharie County, New York uniting the crown of Wattieza with the trunk of Eospermatopteris. Wattieza is a genus of prehistoric tree that belongs to the class Cladoxylopsida. This class is currently placed within the division Pteridophyta. So, fossil stumps at Gilboa are cladoxylopsid trees related to ferns. Ferns diversified and flourished during the Carboniferous, occupying many habitats. Fern species grew as epiphytes, ground cover, understory and canopy in these ancient forests. We will examine several groups of ferns that evolved tree forms. Isolated, but intertwined roots and leaf petioles formed an important part of the stems of ferns with tree and shrub-like forms. Ferns in the order Marattiales range from the Carboniferous to recent times. This was the first modern group of ferns to evolve a structure that we think of as a real tree fern. The Carboniferous arborescent ferns possessed a kind of buttressed or braced trunk. Psaronius was the largest arborescent fern found in the coal measure swamps (Willis & McElvain, 2002, p. 108). Psaronius was up to 10 m tall with a 1 m wide trunk. These tree ferns occupied the drier areas of the swamps and by the end of the Carboniferous replaced arborescent lycopods as the dominant trees in the swamp forests (Cleal & Thomas, 2009, p. 111). Psaronius trees were unbranched trunks supported by prop roots and crowned with large fronds. The trunk had no secondary wood for strength. In cross section, tree fern stems consisted of a narrow cylinder composed of vascular tissue. Enclosing this cylinder was a mantle of petioles and aerial roots, which created a fibrous, tough, lightweight structure (Kenrick & Davis, 2004, p. 71) (click on picture to the left). The root mantle was thickest towards the base of the trunk. Tietea is the stem of another marattialean tree fern from the Permian of Brazil. In cross-section the two tree ferns have the same basic structure, but they can be distinguished. Whereas the vascular tissue is in sinuous strands at the center of the Psaronius stem the vascular tissue in the center of Tietea is found as round, ovoid, or C-shaped bundles. Tietea singularis makes up close to 90% of some fossil assemblages in Brazil. Click on the pictures above and to the left to view cross-sections of a Tietea singularis stem and aerial root as well as a comparison of Psaronius with Tietea. Ferns representing the order Osmundales range from the Permian to recent times. Osmundales is a primitive group that may have important evolutionary ties to many modern fern families. Two families within this order had species that reached tree size. Guaireaceae is an extinct family of ferns that ranges from the Permian to the Triassic. At this time the family is known from four genera of fossil tree ferns. Members of Guaireaceae possess leaf-root-trunk stems. The vascular tissue of a Guairea stem is a dictyostele. In cross-section the stem is composed of pith, a vascular ring, cortex with leaf traces that are C, V, or Y-shaped, and adventitous roots (Tidwell, 2002, p. 150). The structure of the cortex and petiole bases set this family apart from Osmundaceae. The cortex of Guairea is not divided into two zones and the petiole bases lack sclerotic rings. The mantle seems to be made exclusively of roots with no persistent petiole bases. Click on the picture above to look closer at the permineralized specimen of Guairea carnieri from Paraguay. Osmundaceae, the Royal Fern family, makes its appearance in the Permian. Sixteen living species are recognized along with nearly a hundred fossil forms (Miller, 1971). Osmundaceae is the best-represented family of ferns in the fossil record and is known from foliage, stems, roots and reproductive structures. The family diversified and was widespread during the Mesozic era, but decreased in numbers and geographic range during the Tertiary (Tidwell, 2002, p. 135). The ferns in this family have rhizomes that grow upright and produce closely spaced fronds. Not unlike Psaronius, the fossil osmundales also possessed leaf-root-trunk stems (click on picture to the left). The stem is composed of persistent leaf bases and rootlets (Tidwell, 1998). It is the wonderful pattern of leaf traces, petiole cross-sections and rootlets surrounding a central stele (pith, xylem and phloem) in the permineralized stem, which attracts the interest of the fossil wood collector. The vascular tissue (stele) of the Osmunda stem is somwhat dictyostelic. The typical anatomy of the osmundaceous stem in cross-section starts with a centralized pith surrounded by a circle of horseshoe-shaped xylem strands. Phloem tissue is just outside the central xylem and may be just inside as well in some species. A mantle of material surrounds this central stele that is composed of leaf shoots that contain C-shaped xylem strands. As one moves outwards from the center the C-shaped xylem strands become enclosed in a ring of supportive tissue, denoting cross-sections of frond petioles (click on picture to the right). In some specimens one can see that the base of petioles are outlined with stipular wings. Filicales (Polypodiales) is the largest order of ferns today with roughly 9,000 extant species. Filicales range from the Carboniferous to recent. Several families within this group are represented by excellent permineralized stems. Grammatopteris is a tree fern genus from the Permian (click on the picture to the left). It is currently placed in the order Filicales. However, the permineralized stem has characteristics that suggest it is related to Osmundaceae and may represent an early evolutionary link to this family (Taylor, Taylor and Krings, 2009, p. 451; Stewart and Rothwell, 1993, p. 251; Dernbach, Noll, and Robler, 2002, p. 86). The stele of Grammatopteris is either a protostele or a mixed protostele with parenchyma. In cross-section the Grammatopteris stem consists of a protostele surrounded by a three zoned cortex with leaf traces. The stem is surrounded by a dense mantle of petiole bases and roots. Near the base of the tree the mantle expands into an outer region made exclusively of roots. The mantle of adventitious aerial roots buttressed the base of the trunk (Robler & Galtier, 2002, pp. 205 & 228). Permian fossil forests in Brazil have proved to be a great source of permineralized fossil fern trees. In the past decade several new finds have been made including a new small tree fern named Dernbachia brasiliensis (click on picture to the right). The affinity of this fern is not certain at this time. It may be related to early ferns or the order Filicales. In cross-section Dernbachia is somewhat unusual for a late Paleozoic tree fern. The central vascular tissue is in a "star shape", botanically known as an actinostele. The vascular bundle is surrounded by a narrow cortex extending into petiole bases. The exterior consists of a mantle of adventitious roots and petiole bases (Taylor, Taylor, and Krings, 2009, p. 409). Most tree ferns employ a mantle of roots and petioles around a vascular cylinder to form a fibrous trunk. A very unique tree fern, Tempskya, employed a very different strategy for constructing a fibrous trunk. Tempskyaceae are an extinct family of Mesozoic ferns, in the order Filicales, represented by the single genus Tempskya (Tidwell, 2002, p. 153).Tempskya occurs as the silicified false trunk of a Cretaceous aged tree fern. Tempskya is referred to as a false trunk because internally it is composed of not one, but numerous small branching stems and petioles embedded in a mat of adventitious roots (Brown, 1936, p. 48). The stems making up the false trunk appear as circular or lobe-shaped structures measuring roughly 1 cm in diameter. Each small stem is a solenostele. In cross-section the stem has a central pith surrounded by a ring of xylem bounded on both sides by phloem. The outer phloem is surrounded by a pericycle, endodermis and cortex with two to three layers. The roots are mostly circular and measure around 1 mm in diameter (see picture to the left). 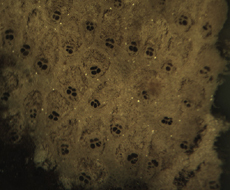 Roots are protosteles with their xylem elements in a characteristic cross-shape. Phloem, pericyle, endodermis and a cortex encloses the xylem. The ropelike mass of the false trunk is often club-shaped, straight or conical when found intact. The mass of intertwined roots gives the exterior a rope or cable-like appearance. Several stems initiated the growth of the tree fern and branched dichotomously in a uniform profuse manner throughout life, producing both the apical and lateral growth of the false trunk. Roots, emerging from the sides of stems, branched profusely filling in voids, tying the mass of stems together forming the false trunk. Roots, greatly outnumbering the stems provided the structural support for the false trunk. Roots growing down ruptured stems and petioles. Upper portions of stems continued to be nourished by emerging adventitious roots. Consequently, transverse sections near the base of the false trunk have few stems and many roots while transverse sections towards the apex of the false trunk have many stems embedded among the roots. Evidence suggests that Tempskya was a short to medium tree fern with diameter of up to 30 cm and heights reaching up to 3 meters. The tree bore small leaves on its crown and for a considerable distance downward from the apex (Tidwell, 1998, p. 190; Andrews, 1943, p. 136; Andrews & Kerns, 1947, p. 155). To learn more, read our article on Tempskya. Cyathodendron is in the family Cyatheaceae, which ranges from the Jurassic to recent. Cyathodendron represents the trunk of an arborescent fern from Eocene strata of Southern Texas (Tidwell, 1998, p. 192; Stewart & Rothwell, 1993, p. 256; Arnold, 1945, p. 18). The small, upright trunks have spirally arranged leaf bases projecting from the exterior, click on picture to the right. 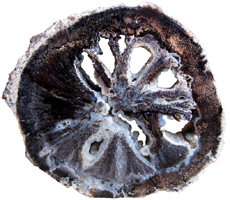 Cyathodendron has an irregular shaped solenostele with numerous medullary bundles. 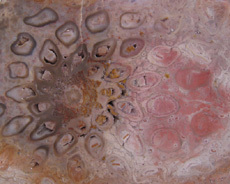 In cross-section one can see numerous vascular bundles embedded within the central pith. Vascular bundles within the pith area are called medullary bundles. Ribbon-like vascular tissue surrounds the pith. The ribbon-like vascular tissue and the medullary bundles contribute to the origination of leaf traces. Adventitious roots arise from the leaf traces. In cross-section petioles exhibit numerous vascular strands. The mantle making up the exterior of Cyathodendron is composed of leaf bases and multicellular epidermal hairs (Tidwell, 1998, pp. 192 & 193; Taylor, Taylor & Krings, 2009, p. 466). Although not an arborescent plant, the beautifully permineralized petioles of the giant fern Acrostichum are worthy of mention. Acrostichum is an extant genus of the leatherferns within the family Pteridaceae. Acrostichum is composed of erect rhizomes bearing very large fronds, up to 3.5 meters in living species. Today these ferns are often found in marsh environments. Evidence for this same type of environment is found for fossil forms as well (Tayolon, Taylor & Krings, 2009, p. 471). Originally, the permineralized fern petioles found in southwestern Wyoming were given the name Eorachis, but are now known to be the petioles of Acrostichum. In cross-section the petioles of Acrostichum are rounded or angular with many having a distinct adaxial groove (click on picture to the left). Internally, the petiole consists of numerous vascular bundles in an omega-shaped configuration surrounded by a sclerenchymatous sheath (Tidwell, 1998, pp. 194 & 195). Progymnosperms (Division Progymnospermophyta) range from the Devonian to the Carboniferous and are thought to represent the plant group from which all seed plants evolved. Progymnosperm trees reached heights of 8 meters and diameters up to 1.5 meters (Willis & McElwain, 2005, p. 110). Progymnosperms are believed to link ferns to gymnosperms. In 1960 the American Paleobotanist Charles Beck published a paper describing the connection between the foliage known as Archaeopteris and the wood Callixylon. Archaeopteris was believed to be a fern, while Callixylon was thought to represent a gymnosperm. The work of Beck demonstrated that the foliage known as Archaeopteris and wood known as Callixylon belonged to the same plant. Archaeopteris is a true missing link between fern-like plants and conifer-like plants (Kenrick and Davis, 2004, pp. 41-43). The trunk (Callixylon) of this tree was constructed of conifer-like wood, while the branches were adorned with fern-like fronds (Archaeopteris). The underside of the fronds had sac-like sori that contained spores for reproduction. Progymnosperms are the earliest trees with modern wood anatomy and growth habit (Taylor, Taylor, and Krings, 2009, p. 479). Progymnosperms stems are eusteles. In cross-section the trunk of Archaeopteris (Callixylon) was very much like modern conifers consisting of a small central pith surrounded by secondary xylem and bark. The solid cylinder construction could support profuse branching. Archaeopteris made up a significant portion of the canopy of early Devonian forests. As we continue to explore various evolutionary strategies for constructing a tree form it is helpful to consider major differences in how plants reproduce. Reproductive strategies have greatly influenced the make-up of forests through time. In the life cycle of plants a gametophyte (haploid) generation alternates with a sporophyte (diploid) generation. The gametophyte is a plant that represents the sexual phase of plant reproduction. The sporophyte is a plant that represents the asexual phase of reproduction. All land plants possess sexual and asexual phases. Seedless vascular plants such as lycopods, sphenopsids, ferns, and progymnosperms possess structures on the sporophyte plant that produce spores dispersed by wind. The spores grow into small, inconspicuous gametophyte plants that possess one set of genetic instructions in their cells (haploid). Gametophyte plants have structures that produce sperm or eggs. Water is required for the sperm to swim to and fertilize eggs, forming zygotes. Zygotes with two sets of genetic instructions (diploid) grow into the large sporophyte plants. The sporophyte plant will once again produce spores continuing an alternation of generations. The stems we have explored thus far are from the sporophyte plant. Wet, humid environments are needed to complete the life cycles of spore producing vascular plants. In plants that produce seeds (gymnosperms and angiosperms) the two phases are bound into a single individual. Gymnosperms produce very small gametophytes within male and female cones or on specialized branches or leaves. The male gametophyte is the pollen, while the female gametophyte consists of eggs in the ovule. The sperm of gymnosperms do not swim through water to reach the ovules (Ginkgo biloba and cycads are the exception, see Taylor, Taylor, and Krings, 2009, p. 744). Wind carried pollen transports the sperm. When pollen lands near an ovule a pollen tube grows towards the ovule. Sperm travel down the pollen tube to fertilize the eggs in the ovule. Seeds provide many advantages for both plants and animmals. Seeds encase the developing plant embryos, providing them with nutrients and protection from the surrounding environment. Seeds allow embryos to remain dormant during unfavorable conditions. Pollen frees gymnosperms from the need to have water for fertilization. Seeds allow gymnosperms to delay germination until favorable conditions exist. These reproductive strategies gave gymnosperms a distinct advantage over the spore producing plants in dry environments. The seeds also became a valuable source of food for animals. Gymnosperms ("naked-seeds") include plants that usually bear their seeds in cone-like structures as opposed to the angiosperms (flowering plants) that have seeds enclosed in an ovary. Gymnosperms range from the Carboniferous to recent times. Modern gymnosperms include the following extant divisions: Pinophyta, Ginkgophyta, Cycadophyta, and Gnetopyta. Conifers (Division Pinophyta) are by far the most abundant and widespread of the living gymnosperms. There are over 700 species of extant gymnosperms. Trunk structures representing solid cylinders and variations of reinforced tube-like cylinders can be found among both extinct and extant gymnosperms. Seed ferns (Pteridospermatophyta) range from the Devonian to the Cretaceous. Pteridosperms had fern-like foliage, but reproduced with seeds (Selmeier, 1996, p. 142). Seed ferns exhibited both vine-like and arborescent forms. The term pteridosperm is descriptive but, misleading as seed ferns are actually early gymnosperms (Cleal & Thomas, 2009, p. 139). Seed ferns are not a monophyletic group. The stems and trunks of many seed ferns are polyvascular, that is they consist of separate vascular segments in the form of wedges. In some species wedges produced secondary xylem (wood) only to the inside, others produced wood towards the inside and outside, and still others produced wood all the way around the wedge. In the past these stems were referred to as polystele. It was thought that each vascular bundle represented a separate stele. The stems are now regarded as a single stele (Taylor, Taylor & Krings, 2009, pp. 566 & 769). Donponoxylon is a genus of large, arborescent seed ferns known from Middle to Late Jurassic deposits of Australia and New Zealand. Until recently Donponoxylon fossils were referred to as Pentoxylon or Pentoxylon-like seed ferns. Donponoxylon stems in cross-section consist of vascular segments surrounding a pith. The vascular segments are oval, wedge or pear-shaped. The segments are variable in number and exhibit secondary growth that is mostly centrifugal (towards the exterior). The segments appear seperate in cross-section but in fact branch and reconnect forming a complex network along the length of the trunk. The genus includes two species, Donponoxylon jacksonii and Donponoxylon bennettii. D. bennettii exhibits peripheral secondary segments that may form concentric, wave-like ring patterns, which D. jacksonii lacks. The central segments of D. jacksonii are larger and more regularly arranged around the pith than D. bennettii. 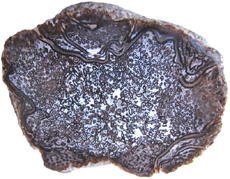 The permineralized axes of Donponoxylon are not associated with any leaf or reproductive structures. Broader relationships with other seed ferns are unknown. Thus, the new genus and species are classified as an incertae sedis spermatophyte or a seed fern of uncertain placement (Tidwell, Britt & Wright, 2013, p. 49). Rhexoxylon (order Corystospermales) is the permineralized stem of a Mesozoic seed fern found in South America, South Africa, and Antarctica. 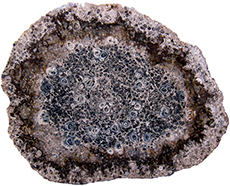 In cross-section Rhexoxylon consists of a central pith surrounded by a ring of primary vascular bundles, click on image to the left. The primary bundles are separated by wide pith rays. Secondary growth produces wedges of secondary xylem both internally (centripetally) and externally (centrifugally) to the primary bundles. The rays are continued during secondary growth giving the wood a segmented appearance. In older stems wedges of secondary xylem separated by segments of parenchyma develop in the outer cortex (Taylor, 1991, pp. 183 & 184). Secondary wood and sclerotic nests develop in the pith and rays. No living tree exhibits this kind of growth today. Glossopteris (order Glossopteridales) is a seed fern with a eustele vascular bundle (concentric vascular bundles with enclosed pith), which is characteristic of conifers and dicot angiosperms (click on picture to the right). Seed fern stems were composed of conifer-like wood. The vascular cambium of these plants produced both secondary xylem and secondary phloem. Cork cambium produced periderm on the exterior. The solid xylem making up the trunks of these early arborescent gymnosperms made them strong and resistant to buckling. The adaptation of a woody cylinder stem would appear later in angiosperm dicots. Solid, woody trunks can support profuse branching and large crowns. Paleozoic flora included progymnosperms and gymnosperms; however, ferns and clubmosses dominated (Paleophytic flora). As the climate became drier, paleophytic flora would give way to a new Mesophytic flora during the Triassic period. Woody seed-bearing plants and their relatives would come to dominate the Mesophytic flora. Thus, the change from Paleophytic to Mesophytic represented a change in reproductive strategy; from spore producers to seed producers. Conifers, cycads, and ginkgoes diversified during this time and dominated the landscape (Kenrick & Davis, 2004, p. 143). Schilderia is a distinctive gymnosperm genus found in Triassic aged deposits. Schilderia was a large tree with a solid woody cylinder. This genus can be easily recognized by its large rays, which are clearly visible to the naked eye (click on picture to the right). Under magnification the cell arrangement within the rays can be seen to take on a chevron pattern. The stem and ray anatomy is like that of Ephedra or Morman Tea. Schilderia seems to be a likely candidate for the ephedracious pollen found in the Chinle Formation. It has been suggested that Schilderia has affinities with Gnetphyta (Tidwell, 1998, p. 216; Wright, 2002, pp. 130 & 131). Hermanophyton represents the genus of an extinct gymnosperm stem found in Jurassic aged deposits of Colorado and Utah. The genus is also represented by one Late Cretaceous aged specimen from the Aken Formation collected in the Bingeberg-Flöeg sandpit in Hauset, Belgium (Knoll, 2010, pp. 181-185). The stems of Hermanophyton range from 3 to 22.5 cm in diameter and up to 18 m in length. In cross-section the stem consists of a central pith surrounded by 9 to 15 petal-shaped segments of secondary xylem (click on picture to the left). Wide primary rays radiate out from the pith inbetween the xylem segments. Vascular cambium added secondary xylem to the woody wedges and secondary phloem toward the outside. The wedges making up the xylem cylinder are surrounded by a layer of cortex and ramentum. Hermanophyton was most likely a small to medium narrow stemmed tree reaching heights of 18 meters and crowned with small leaves which dropped off as the plant grew leaving behind numerous, small, persistent leaf bases (Tidwell & Ash, 1990, pp. 87 & 88). Fossil stems of Hermanophyton maintain a fairly consistent diameter over substantial lengths. The stem acted as a solid cylinder; however, there is little evidence of branching. No leaves or reproductive structures have been associated with Hermanophyton so its affinity with other gymnosperms is uncertain. Thus, it is an incertae sedis gymnosperm (Tidwell & Ash, 1990). To learn more, read our article on Hermanophyton. Cycadopytes (division Cycadophyta) made up a significant portion of the Mesophytic flora. The Mesozoic is sometimes referred to as the "age of cycads". Cycadophytes are gymnosperms that have a superficial resemblance to the flowering palms. Cydadophyte trunks range from short and squat to tall and columnar or tree-like. Stems are covered with a protective layer of persistent leaf bases. Leaves can be scale-like or in the form of fern-like fronds. One living and one extinct order are recognized within this division. True cycads, both living and extinct belong to the order Cycadales. Cycads range from the Permian to recent times. The extinct order Cycadeoidales or Bennettitales range from the Triassic to the late Cretaceous. In the U.S. this order is referred to as Cycadeoidales, while in Europe it is known as Bennettitales. 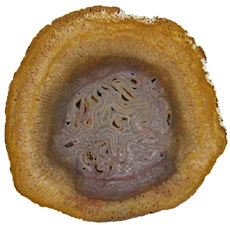 In cross-section both cycad and cycadeoid stems are eusteles consisting of a large pith surrounded by a ring of vascular tissue (click on picture to the right). The ring of vascular tissue is composed of secondary xylem and secondary phloem. Wide rays dissect the vascular ring. 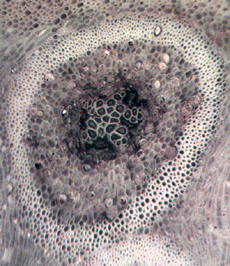 Cortex tissue surrounds the vascular ring. Finally, a ramentum made of persistant leaf bases provides a strong outer covering (Stewart & Rothwell, 1993, pp. 358 & 359). Leaf scars on the exterior are diamond shaped. In a broad sense, the cycadophyte stem is a variation of the tube-like structure. Cycads and cycadeoids can be distinguished by the structure of leaf traces and leaf stomata. The cones of cycads are found at the apex of the plant while in cycadeiods they are found embedded among the leaf bases. Charmorgia and Lyssoxylon are two important fossils found in the Chinle formation of Arizona that belong to Cycadales (Tidwell, 1998, pp 196-197). Many Mesozoic species had slender branching forms. Extant short, squat cycad forms did not appear until the Tertiary (Willis & McElwain, 2002, p. 135). One group of cycadeoids had a short barrel-like trunk crowned with large fronds. A second group was more shrub or tree-like. Perhaps the most well known cycadeoid genus is Williamsonia. Williamsonia resembled a shrub or tree and grew to a height of 3 meters. Williamsonia reached its greatest diversity during the Jurassic. The cones of cycadeoids are remenescent of flowers. Some paleotologists have suggested that the cycadeoids may have a close evolutionary relationship with angiosperms (flowering plants), although current evidence makes this tie unlikely. Both Cycadales and Cycadeoidales most likely evolved from medullosan seed ferns (Willis & McElwain, 2002, pp. 136-137). The Maidenhair tree or Ginkgo biloba is the only living species representing the division Ginkgophyta. Representatives of the order Ginkgoales date back to the Permian, but the genus Ginkgo makes its first appearance in the Jurassic. In fact, Ginkgophytes reached their greatest diversity during the Jurassic. Fossil evidence indicates that at least 16 genera of ginkgophytes made up a significant part of the Mesozoic vegetation (Willis & McElwain, 2002, p. 139). Ginkgos declined in the Paleogene and Neogene, becoming nearly extinct (Tidwell, 1998, p. 102). Ginkgo trees have a constellation of characteristics, making their origin difficult to discern. The Ginkgo tree grows to 30 m. The fan shaped leaves of Ginkgo remind one of a deciduous flowering plant. The reproductive structures of the Ginkgo are more like that of a cycad. The roots and stems of Ginkgo are conifer-like. In cross-section the Ginkgo tree is a solid woody cylinder with a small pith, secondary xylem and bark. 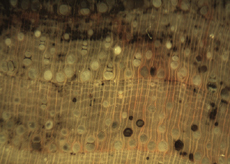 Ginkgo wood is very conifer-like; however, in cross-section the small tracheids are highly variable in size, which somewhat disrupts the radial arrangement (click on picture to the left). Ginkgo also has large parenchyma cells scattered among the tracheids. 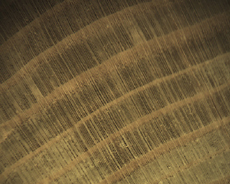 Conifer tracheids in cross-section are of nearly equal size, except for growth rings and exhibit an orderly radial arrangement. Fossil leaves of ginkgos are common, while reproductive structures and wood are rare. Pinophytes, more commonly known as conifers, range from the Carboniferous to recent times. Cordaitales and Voltziales are well-known extinct orders of the division Pinophyta. The order Pinales has both extinct and extant genera. Pinales includes such familiar plants as pine, spruce, Douglas-firs, firs, cypresses, cedars, junipers, larches, sequoias, and yews . Two primitive conifer orders have important evolutionary ties to modern day conifers in the order Pinales. Cordaites (order Cordaitales) are conifer like plants that range from the Pennsylvanian to the Permian. Cordaites grew as shrubs and trees. Cordaite trees possessed a slender trunk adorned with a branching crown of leaves. Cordaite stems were eusteles that possessed a rather large pith. As the tree grew the pith broke down to create a hollow area. Artisia is the pith cast of Cordaites. The stem was composed of secondary wood surrounded by bark. In a broad sense the mature trunk was a variation upon the tube-like structure. Cordaites had long leathery straplike leaves with many parallel veins The leaves were spirally arranged around the stem. Voltziales (order Voltziales), commonly known as walchias, range from the Carboniferous to the Triassic. Voltziales were large trees that possessed needle-like leaves. The trunk was a solid woody cylinder with pith, secondary xylem and bark. Voltziales are traditionally viewed as an evolutionary transition between Cordaites and modern families of Conifers (order Pinales) (Bhatnagar & Moitra, 1996, p. 167; Taylor, Taylor, & Krings, 2009, p. 828). Pinales originated from members of Voltziales, which in turn have their origins within the Cordaitales (Willis & McElwain, 2002, p. 150). The fossil record of modern Pinales families dates back to the Triassic (Taylor, Taylor, & Krings, 2009, p. 870). Several conifers, representing the family Araucariaceae, from the Triassic and Jurassic are sought by collectors. 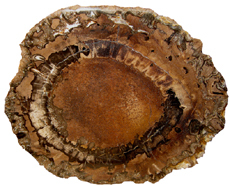 If you acquire a conifer from a Mesozoic wood deposit that is composed of moderate sized tracheids, uniseriate rays with no resin canals or wood parenchyma it is a good bet that it will have been identified as Araucarioxylon. 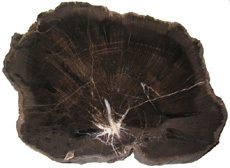 Perhaps the most well known fossil wood specimens assigned to this genus are the permineralized trunks of the Petrified Forest National monument in Arizona. If a specimen with the same characteristics of Araucarioxylon is found in older, Paleozoic deposits it will be referred to as Dadoxylon. It has become increasingly clear that the wood ascribed to Dadoxylon and Araucarioxylon represent a wide array of Paleozoic and Mesozoic plants (Stewart & Rothwell, 1993, p. 416; Savidge, 2007, p. 324). 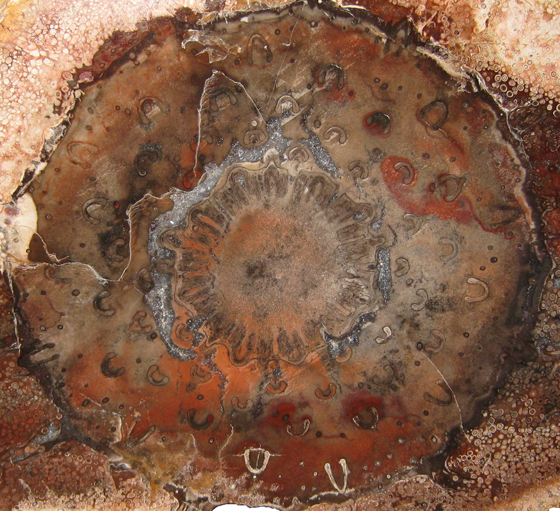 Some have argued that the pith structure, as seen in cross-section, can be used to distinguish between Dadoxylon and Araucarioxylon, making the age of the material irrelevant. The pith of Dadoxylon is variable in size but large, while the pith of Araucarioxylon is small and visually non discernable (Wright, 2002, pp. 129). A precise identification of these early conifers would require transverse, radial, and tangent sections. 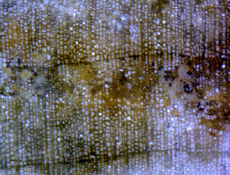 The tracheids making up the secondary wood of Woodworthia is araucarioid; however, in cross-section one can see short-shoot traces connecting the pith to short-shoot scars or knots on the exterior (Click on picture to the right). In life the tree was graced with many thin branches bearing clusters of leaves. Based upon the size of the short-shoots and exterior scars it seems clear that multiple species of Woodworthia existed in the early Mesozoic. Today members of the order Pinales can be found in just about any environment in the world. In some biomes, such as the Taiga, conifers are the dominant plant. Modern day conifers grow as shrubs or trees. Some arborescent conifers exhibit a pyramidal growth form. Leaves are usually needle-like, but can also show a broad flat shape. Conifers bear seeds in woody cones, except for junipers and yews, which have a berry-like structure. In modern day conifers secondary growth begins early. The vascular cambium produces secondary xylem to the inside and secondary phloem to the outside. The cork cambium produces pelloderm to the inside and phellen (cork) to the outside. All of the tissues produced outside the vascular cambium comprise the bark (click on picture to the right). Thus, the typical gymnosperm stem is a eustele with central pith surrounded by substantial amounts of secondary xylem, which in turn is enclosed by bark (Raven, Evert, & Curtis, 1981, pp. 340-343). The water conducting cells of gymnosperms are tracheids (click on picture to the left). Tracheids are closed tubes with pits along their length. Water zigzags through paired pits of overlapping cells up through the plant. New, living wood produced by the vascular cambium towards the inside of the trunk is termed sapwood. The main function of sapwood is to conduct water and minerals throughout the plant. Sapwood also stores reserves made within the leaves. However, the tube-like xylem cells only become fully functional water conducting cells after they lose their protoplasm and die. The older wood in the center of the stem is termed heartwood. The transition from sapwood to heartwood marks the area where xylem tissue shuts down and dies. In some species tracheids making up the heartwood act to store waste products called extractives as they age and no longer conduct water. Rays are ribbon-like tissues that cross the growth rings at right angles. Medullary rays connect the cental pith to the cambium. Rays are made primarily of living parenchyma cells and function to carry sap radially through the plant. The rays of conifers are usually very thin, being one to two cells wide. Overall, the rays of softwoods (conifers) account for 8% of the woods volume (Raven, Evert, & Curtis, 1981, p. 492). Trunks formed from solid xylem tissue are very strong and resistant to buckling (Kenrick & Davis, 2004, pp. 69-70). As long as the tree is alive, vascular cambium, just beneath the bark, continues to produce xylem, increasing the girth of the stem, layer by layer. Trees growing in temperate regions experience life cycles that include seasons of growth and dormancy. 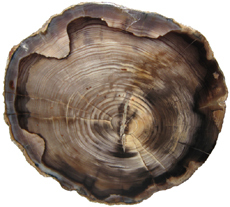 Seasonal growth results in growth rings or annual rings (click on picture to the right). Earlywood consists of tracheids that have a wide diameter with thin walls; whereas latewood consists of tracheids with smaller diameters and thick walls. In tropical climates, growth may be consistent year around, resulting in wood that does not have growth rings (Hoadley, 1990, p. 10). Some conifers possess tubular passages in their wood called resin canals. Resin canals are intercellular spaces lined with epithelial cells (click on picture to the left). The epithelial cells exude pitch or resin, which functions to seal wounds caused by mechanical damage or boring insects. Resin canals can be found in four genera of the family Pinaceae (Pinus, Picea, Larix, and Pseudotsuga). The presence of resin canals helps to separate species within these genera from all other conifers (Hoadley, 1990, p. 20). Pines have relatively large resin canals. The resin canals in pines can be found distributed somewhat evenly throughout the growth ring. Resin canals in pines are usually found singly. 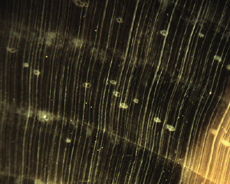 The epithelial cells surrounding the resin canals in pines are thin-walled (click on picture to the right). In spruces, larches, and Douglas-fir resin canals are distributed unevenly. The resin canals are relatively small and often occur in tangential groups of two to several (click on picture to the left). 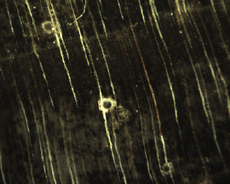 Some growth rings may lack resin canals. 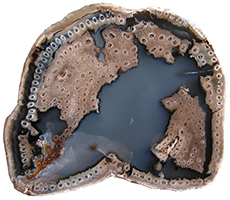 The epithelial cells surrounding the resin canals are thick-walled. Traumatic resin canals may also form as a result of environmental stress in both species that have resin canals as well as species that do not normally have them. Traumatic resin canals appear in cross-section as a single continuous line extending for some distance along a growth ring. Traumatic resin canals are usually only slightly larger than tracheids (Hoadley, 1990, pp. 20-21). 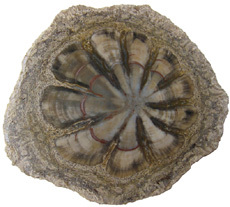 Although still successful today, gymnosperms dominated the world's Mesophytic flora from the Triassic to the Early Cretaceous. Flowering plants first emerge during the Early Cretaceous and undergo a great adaptive radiation during the Middle Cretaceous. Flowering plants quickly became a major constituent of species diversity and the world entered the third great age of plant life known as the Cenophytic by the Late Cretaceous (Kenrick & Davis, 2004, p. 143). The transition from Mesophytic to Cenophytic represents a change in reproductive strategy. Gymnosperms and their relatives relied mostly on wind pollination and bore naked seeds clustered in cones, on leaves, or on the end of stocks. Flowering plants coevolved with animal pollinators, underwent double fertilization, and encased seeds in a fleshy ovary (fruit) that encouraged seed dispersal. Our modern plant world is a continuation of the Cenophytic age of plants. New reproductive strategies helped angiosperms become a great success and diversify into the forms we know today. In angiosperms male and female structures develop within flowers. The pistil is the central, female organ of the flower and typically consists of an ovary with ovules, a style and stigma. The stamen is the male part of a flower and typically consists of a filament or stalk topped with pollen producing anthers. When pollen comes into contact with a flower's stigma the growth of a pollen tube is activated. Each pollen grain carries two sperm. One sperm fertilizes an egg in the ovule; the other sperm unites with two haploid cells in the same ovule. This process is known as double fertilization and is an important adaptation found in angiosperms. The fertilized egg will undergo cell division to become a zygote and then an embryo. The second fertilization results not in offspring, but rather the development of endosperm, which acts as a nutrient for the embryo. Cells in the endosperm have three sets of chromosomes (triploid). Endosperm not only serves as an important food source for the embryos of flowering plants it also is important to animals. Humans depend upon the endosperm of rice, wheat, and corn. A seed is formed when the endosperm and the embryo become enveloped in a part of the ovule that hardens into the seed coat. The ovary or other parts of the flower in angiosperms develop into a fleshy fruit surrounding the seeds. Many organisms such as birds, bats, and insects have coevolved to help pollinate angiosperms. The fleshy fruits of angiosperms are an adaptation for seed dispersal. Many animals use the fruit as a food source, which results in the dispersal of seeds encapsulated within a natural fertilizer! In addition to new reproductive strategies flowering plants also exhibit adaptations to their vascular tissues. Sieve-tube members in the phloem and vessel elements in the xylem are found in most flowering plants. 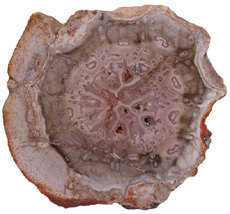 In fact, the presence of vessels in fossil wood is usually a good indication that it is an angiosperm. However, one must keep in mind there are vesseless dicot families, such as Trochodendraceae and gymnosperms that possess vessels in the order Gnetales. Still, vessels are vital in fossil wood identification. Flowering plants or angiosperms (phylum Magnoliophyta) range from the Cretaceous to recent times. Extant angiosperms are represented by over 300,000 species. Traditionally angiosperms are divided into the monocotyledons and dicotyledons. Today angiosperms are divided into the monocots, eudicots, and magnoliids. Monocots and eudicots are monophyletic groups. Eudicots contain most of the dicots. It is useful to known the major differences in stem structure between monocots and dicots (eudicots & magnoliids) when studying both extinct and extant plants. Woody dicots possess eustele stems, a central pith surrounded by secondary wood and bark (see picture above). The woody stems of arborescent dicots are strong and resistant to buckling. Vascular cambium produces secondary xylem to the inside and secondary phloem to the outside. Most angiosperms have cell types that are distinctly different in size making up their xylem tissue (wood). Vessel elements are larger diameter water conducting cells. 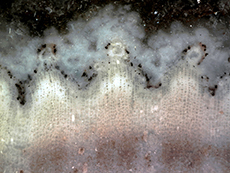 Smaller, less numerous, water conducting cells called tracheids along with abundant fibers can also be viewed in cross-section (click on picture to the left). Vessel elements have pits along their sides just like tracheids. However, vessel elements also have perforations or holes, which can be at both ends and along their length. Vessel elements are joined into long continuous columns to form vessels or pores. Vessel elements are thought to be much more efficient at conducting water up the plant than tracheids. The rays making up the hardwood of dicots can be from one to 30 cells wide depending upon the species. Oak rays can be 30 cells wide and hundreds of cells high, making them visible to the naked eye. Rays make up, on average, 17% of the volume of wood in hardwoods (Raven, Evert, & Curtis, 1981, p. 492). The wood of angiosperm dicots is more complex than that of the conifers. This complexity can actually make identification easier in some instances. The distribution of vessels in cross-section aids in hardwood identification (click on picture to the right). Three types of vessel distribution are recognized. Ring-porous woods are characterized by a row or rows of relatively large earlywood vessel or pores. Vessels throughout the rest of the growth ring are much smaller in size. Oak, elm, and hickory are typical ring-porous woods. Semi-ring-porous wood possesses relatively large early wood pores. Pores in the growth ring gradually reduce in size from early to late wood. Live oak, tanoak, and walnut are typical semi-ring-porous woods. Diffuse porous woods possess vessels of equal size from early to latewood. Beech, sycamore, maple, and cherry are diffuse-porous woods (Hoadley, 1990, pp. 99-100). The roots of angiosperm dicots are protosteles. 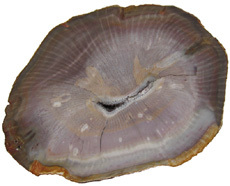 The absence of a pith can be helpful in identifying fossil wood as a root. Monocots usually lack secondary woody growth. However, there is at least one arborescent fossil monocot exhibiting secondary growth. More common are species, like the palms, which produce fibrous, wood-like stems to construct a tree form using only primary growth. In cross-section monocot fiber is fairly uniform yielding little specific taxonomic information. Palm stems are a variation of a eustele, called an atactostle. In cross-section fibrous monocots possess scattered vascular bundles embedded in a ground mass of parenchyma tissue (click on picture to the right). The vascular bundles can give a spotted appearance to the palm fiber. In the center of the stem vascular bundles are spaced far apart. Towards the periphery of the stem the vascular bundles become more numerous and crowded. Longitudinal cuts reveal that the vascular bundles form rod-like structures. The roots of palm are eusteles. 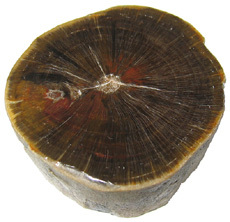 Fossil palm roots are known by the form genus Rhizoplamoxylon. The scattered vascular bundles making up the palm trunk and adventitious roots form a fibrous composite, a design strategy that evolved earlier in the tree ferns. If you like palms, you may want to read our article on Palmoxylon of the Catahoula Formation. In some members of the family Asparagaceae, such as Dragon trees (genus Dracaena), Cordyline and the Joshua tree (Yucca brevifolia) a secondary thickening meristem (STM) develops in the cortex. The STM extends down the sides of the stem and produces parenchyma cells internally. Some of the rapidly dividing parenchyma cells differentiate into secondary vascular bundles. Other parenchyma cells form a secondary ground tissue. Thus, the STM produces a cambium-like cylinder composed of vascular bundles in a parenchyma matrix. This unusual secondary growth increases the conducting capacity and strength of the stem. Monocots with this type of secondary growth do increase in diameter with age (Mauseth, 2014, p. 193; Walters & Keil, 1996, p. 397). Protoyucca shadishii is represented by permineralized stems from Middle Miocene strata in northwestern Nevada. This rare fossil has the distinction of being the first recognized permineralized fossil monocot with secondary growth. P. shadishii is thought to be an ancestor of the present day Joshua tree, Yucca brevifolia. The Joshua tree was thought to be a giant member of the lily family (Liliaceae), but DNA evidence has placed it in the family Asparagaceae. In cross-section the stems of P. shadishii consist of a primary cylinder surrounded by a secondary cylinder. Secondary cortex and periderm form the exterior (click on picture to the left). The primary cylinder is composed of vascular bundles randomly distributed among parenchymatous tissue. Some of the tissue in the primary cylinder disintegrates, resulting in radiating spoke-like spaces. The secondary cylinder is made up of radially aligned secondary bundles, produced by a secondary meristem. The arrangement of the bundles gives the false appearance of growth rings. Each bundle is composed mostly of secondary xylem and some phloem. The stems of P. shadishii grew to 60 cm or more in diameter (Tidwell & Parker, 1990, pp. 81 & 82; Tidwell, 1998, pp. 246 & 247). The Protoyucca stem is a variation of the tube-like structure. Growing taller than surrounding plants can be of real value when competing for sunlight; the tree form affords the adaptive advantage of height. The value of the arborescent form is reflected in the convergent evolution represented by the various tree forms we have examined. Several strategies for trunk designs have evolved multiple times. Arborescent lycopsids, horsetails, cordaites, cycadophytes and at least one moncot with secondary growth utilized tube-like structures for their trunks. Arborescent ferns and later monocots (palms) employed individual elements to form a fibrous composite trunk. Finally, progymnosperms, many gymnosperms and angiosperm dicots constructed trunks of solid xylem cylinders. These different trunk designs co-opted a variety of plant tissues and organs as strengthening elements. The student of permineralized tree forms can learn to identify these different evolutionary strategies and enjoy their unique structures. Click on the word anatomy for a revised, printable version of our article. Elias, T.S. (1980). The Complete Trees of North America. New York: Van Nostrand Reinhold Company. Kenrick, P. and Davis, P. (2004). Fossil Plants. Smithsonian Books: Washington. Robler, R., & Galtier, J. (2002). First Grammatopteris tree ferns from the Southern Hemisphere-new insights in the evolution of Osmundaceae from the Permian of Brazil. Review of Palaeobotany and Palynology, vol 121, pp. 205-230. Tidwell, W.D. and Ash, S.R. 1990. On the Upper Jurassic Stem Hermanophyton and its Species from Colorado and Utah, USA. Palaeontographica 218, 77-92. Tidwell, W.D. 1998. Common Fossil Plants of Western North America. [2nd Edition]. Smithsonian Institution Press: Washington, pgs 214-215. Willis, K.J. & McElwain, J.C. (2002). The Evolution of Plants. New York: Oxford Univeristy Press.